We offer for holidaymaking a threshing-type house, which was built in the beginning of last century and has now thoroughly been renovated. Good accommodation place for nature friends and families. From us you can order trips on the sea with a small ship, riding in the neighbouring farm, guiding service, band and national dance. Also popular are picnics in the beautiful farmhouse garden, where there is a campfire site and a big outside fireplace. Catering on pre-booking. 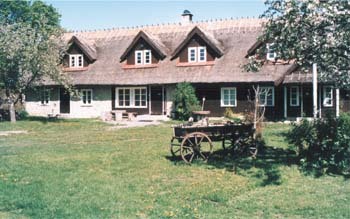 Jurna Recreation Farm in Saaremaa dates from the beginning of the 20th century. It is situated in Upa village, only 6 km from Kuressaare. This makes sightseeing comfortable while staying there. Open all year around. 5 double rooms, 2 single and one suite - 50 m² (1-4 people) particularly suitable for families; max. 18+6 beds. Showers and sauna are available. We also have a dining hall for 46 persons and a catering place outside for 50 people. It is always possible to order lunch or dinner from our hostess. Large garden and a fireplace are at guests disposal at any time.